Large, luxury ground floor suites unique, adaptable and yet retaining comfort at the Gold Award standard associated with Double-Gate Farm. Designed for able and disabled, families and groups. Three suites have a double and single bed and one has a double and two single beds. Begin the day with with one of our scrumptious breakfasts. Our menu has a lot to choose from: traditional farmhouse breakfast - succulent posh bangers - pancake frutie - West Country kippers . .
All in all there are a dozen different breakfasts to suit most dietary requirements plus a breakfast bar of cereals, yogurts, compots, cheese, fresh fruit and juices. Bread is homemade, tomatoes and grapes come from our greenhouse when in season. Local produce used wherever possible..
Riverside Suites. Large, luxury ground floor suites unique, adaptable and yet retaining comfort at the Gold Award standard associated with Double-Gate Farm. 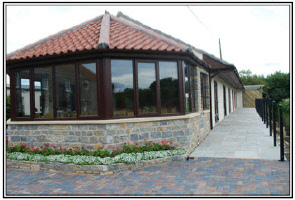 Designed for able and disabled, families and groups. Three suites have a double and single bed and one has a double and two single beds. All beds have pocket sprung mattresses for comfort and are on gliders to enable access from any side. Ceiling fans, mood lighting and touch lighting, colour TV/DVD, and silent running fridge. Ample turning space for wheelchairs. Each suite has a river side patio area with table and chairs, access by large glass, patio doors. Watch the fish in the river or birds in the meadow. Every suite has a wet room. In other words a very large en-suite bathroom! Comprising power shower, two wash basins at different levels, choice of shower seating if required, perching stool and WC. Just to make life a bit more interesting(!) 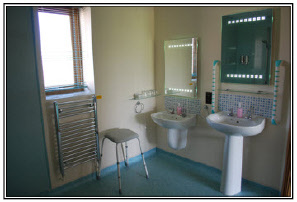 there are sensory mirrors which light up and demist by the movement of a hand and very funky striped grab rails. 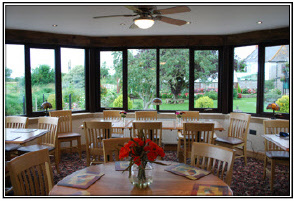 Lovely large dining room with 180 degree views of the house, garden and countryside. Completely accessible and very attractively designed. All tables capable of being wheeled under with ample space around. High chairs for “little legs” and ceiling fans in summer. Solid ceiling, so no over heating! Colour TV with sub titles and a Hearing Loop. Cold buffet with a range of our own and local produce. Extensive menu. 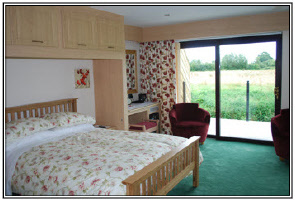 £45.00 - £50.00pppn B&B based on two or more people sharing. Single occupancy £75.00pppn. B&B. Reductions for children after first two bed spaces. Double-Gate is totally non-smoking except for the garden. In wet weather, smokers are welcome to fumigate the white fly in the green house ! Other residents at Double-Gate are our family pets. 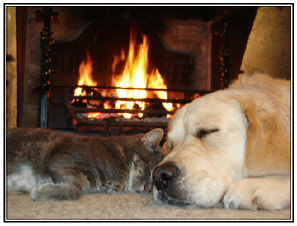 For their comfort we do not accept any pets except assistance dogs.